Aotearoa would never clear the shallow sandbar protecting Clipper Cove’s entrance. Fortunately several members of ETNZ used a land route to visit TISC on Wednesday, sharing high 5’s with our kids and challenging our instructors to a few informal races. 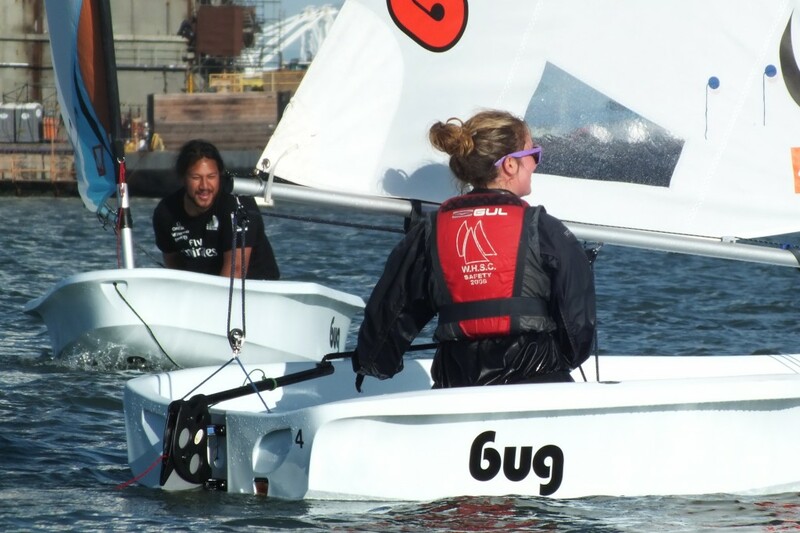 The excitement of this year’s Americas Cup is not lost on our students, especially those involved in weekend regattas California. 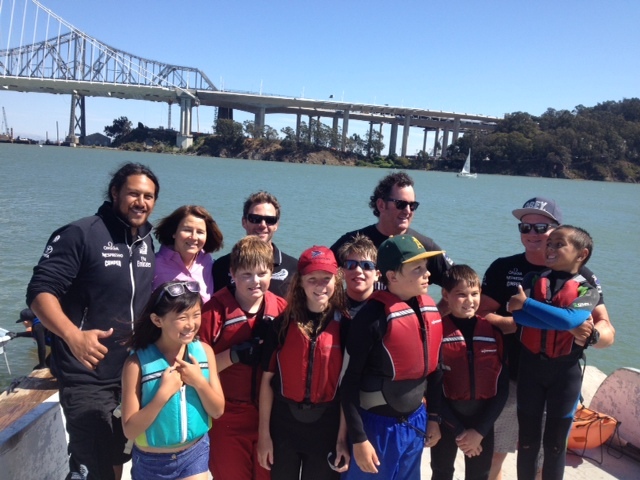 No surprise our students were all smiles to see four members of Emirates Team New Zealand show up at Pier 12 to watch them sail, answer their questions and get out in TISC BUGS for a few races with our instructors. 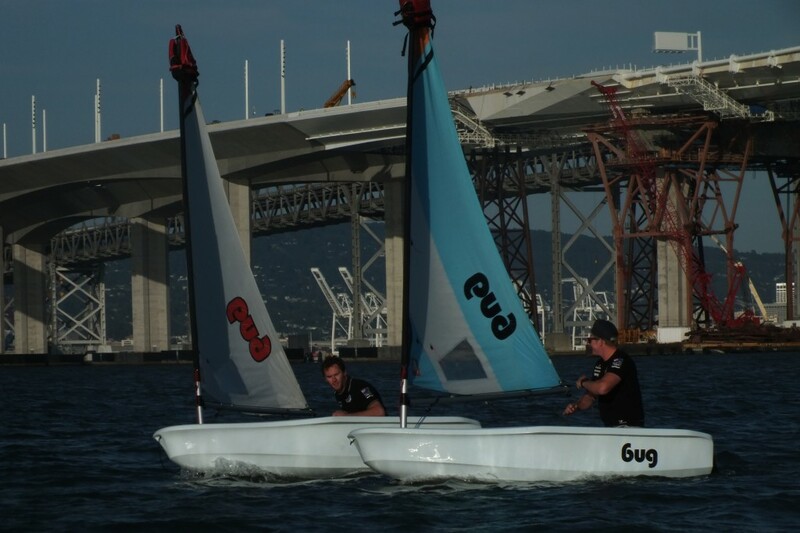 Rigging an 8′ Opti or Bug is simple compared to readying a 13,500 pound carbon fiber winged catamaran to race (see “Preparing ETNZ for Racing“), however they share one common characteristic: there is a right and wrong way to rig any sailboat and to be successful during a race you better do it the right way. Learning early on to rig their own boats helps build student self conficence. The impact positive role models have on our students is even more valuable than the four-point “life skills” learning we teach here at TISC. 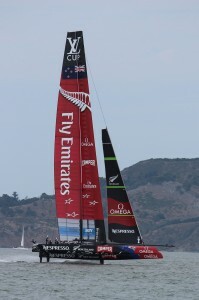 When the role models are wearing black shirts, represent Emirates Team New Zealand and speak “with a way cool accent” ( according to the students I talked with at TISC today at lunch) then even better. Kids “get it” when adults are willing to share time with them – even if the the “thank you”s are not alway verbalized. Clipper Cove provides a picturesqe venue for sailing and hosting a few races for our visitors from Down Under and TISC instructors provided everyone with an opportunity to do what we all like best -SAIL ! The pictures below are courtesy of our Program Director Chris Childers and Head Instructor Ann Butts. 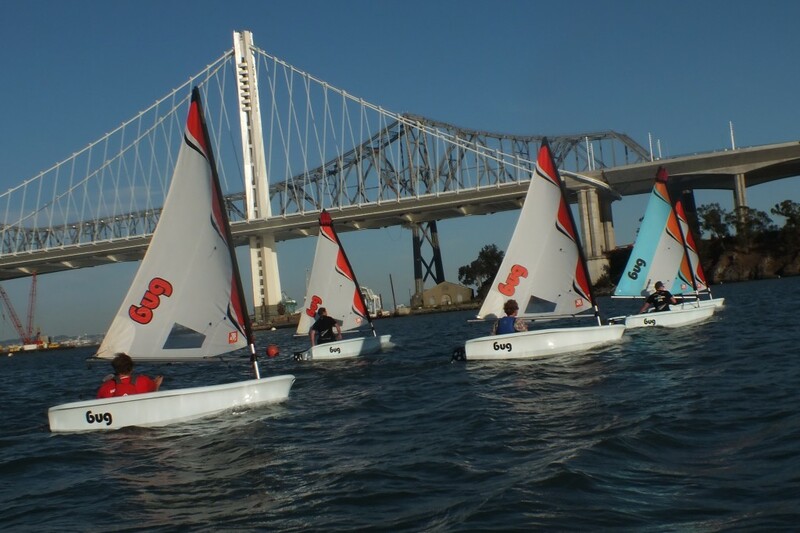 There are many opportunities for volunteers to support our programs here at Treasure Island Sailing Center. 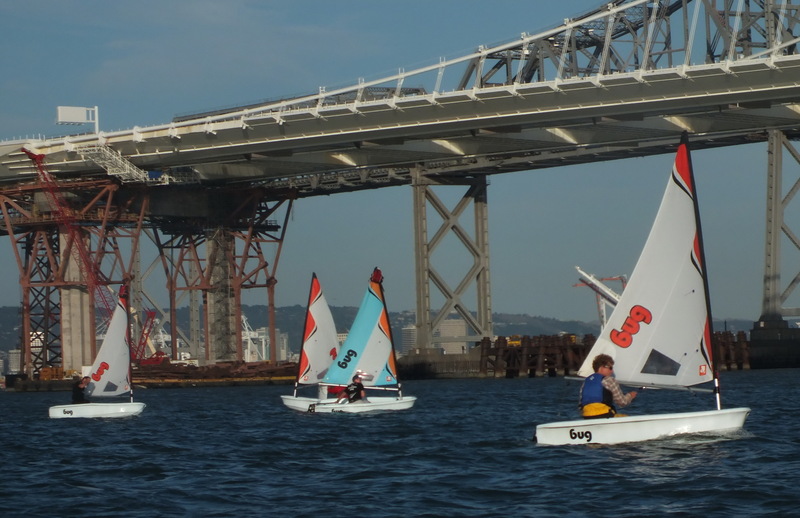 The most fun are the on-the-water sailing and by far the most rewarding are seeing the smiles on the faces of kids of all ages when the light first goes and they’re able to sail solo around Clipper Cove. 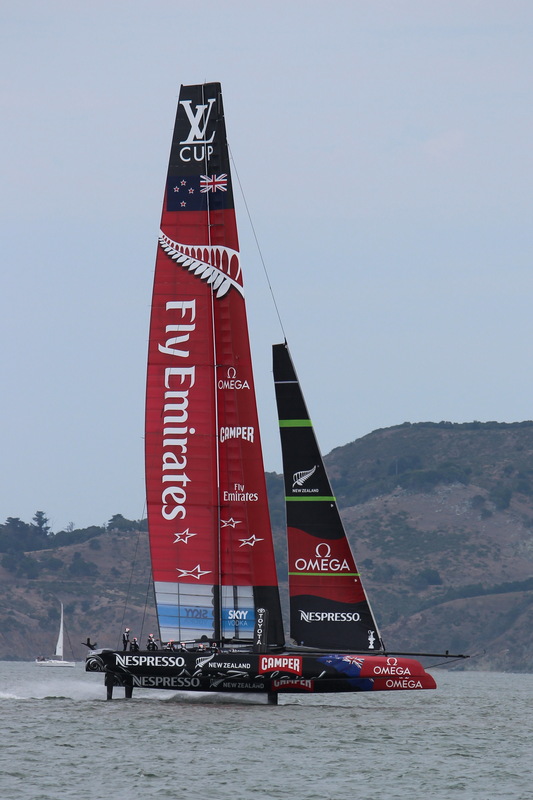 Thanks again Emirates Team New Zealand for sharing your time and love of sailing with our team, much appreciated ! 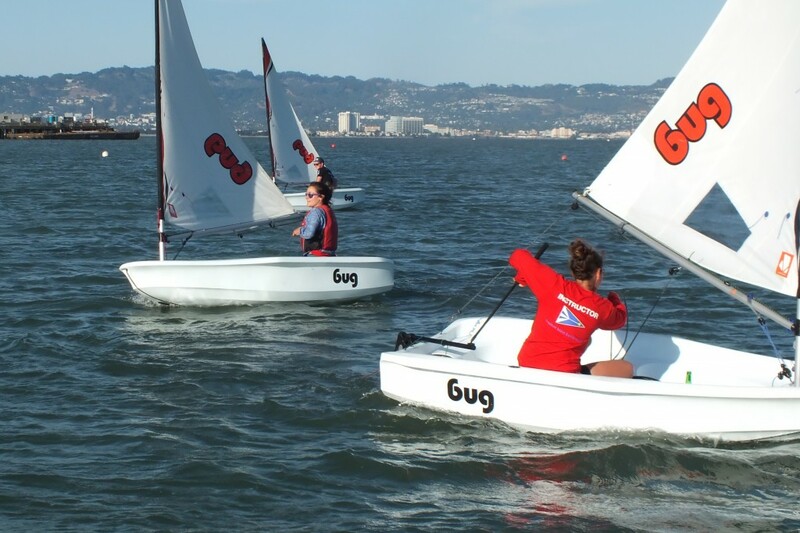 If you are a friend, a regular volunteer or a tenant here at TISC looking for volunteer hours you may have received an email recently listing up-coming opportunities to spend time on the water sharing YOUR love of sailing with others. In case you missed it, see below. 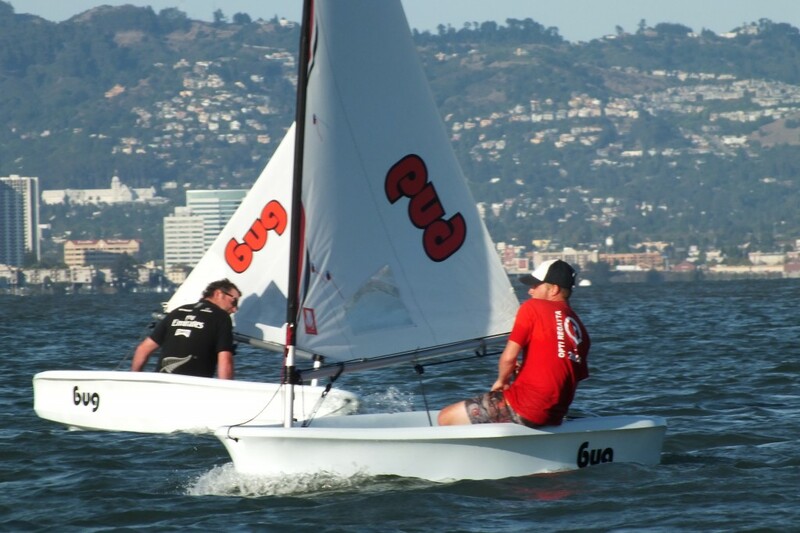 Please contact Chris Childers (programs@tisailing.org, 415-421-2225) if you can help on one or more of these dates.